WELDING: A 90-hour basic welding course. Next class begins Feb. 25, 2019. Complete information for adults click here and for high school students click here. To register contact Angela Hamberg at 567-360-6099. ROBOTICS - A 30-hour course for those interested in robotics training. Next class begins March 12, 2019. Complete information for adults click here and for high school students click here. Students can earn FANUC certification. To register, contact Angela Hamberg at 567-360-6099. 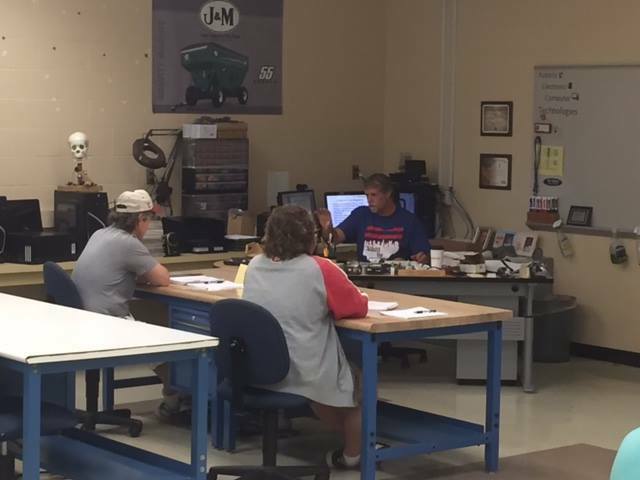 PRECISION MACHINING: A twelve week basic machining course for incumbent/employer sponsored workers only. Next class begins March 4, 2019. Employers should contact Angela Hamberg at 567-360-6099 for information. CONSTRUCTION: A two-week adult construction class will be offered beginning March 4, 2019. Click here for complete information. If you have an interest, please contact Angela Hamberg at 567-360-6099. You must be 18 years of age to enroll. High school students may enroll if they are 18 years of age or are enrolled in a state recognized career technical program (such as those at Tri Star) . To print an ENROLLMENT APPLICATION click here. Adult Education classes are coordinated by Angela Hamberg, WDI Director. Questions? Contact her by phone: 567-360-6099 or email: wdi@hometownopportunity.com.